Traces of gilding and polychromy; the inkwell in the shape of a two-handled vase with lid; the inside of the inkstand with old collection label 'COLLECTION No WERNHER'; the reverse of the base inscribed '433-51'. Blackish brown patina with warm chocolate brown high areas; minor casting flaws; hole where one horn lacking. Augustus the Strong, Elector of Saxony and King of Poland (1670-1733, reg. Saxony 1694-1733, Poland 1697-1704, 1709-1733), in an engraving of items of whose collection it appears in 1733. Sir Harold Wernher, 3rd Bt., G.C.V.O. (1893-1973), Bath House, London, and from November 1948, Luton Hoo, Bedfordshire, in the Dining Room, and by descent. B. Leplat, Recueil des marbres antiques qui se trouvent dans la galerie du Roy de Pologne à Dresde, Dresden, 1733, pl. 192. 1913 Bath House Inventory, no. 51, p. 11, in the Red Room, on the Mantelpiece. 1914 Wernher Inventory, no. 44, p. 11. 1949 Luton Hoo Inventory, p. 11, in the Dining Room, noted as having been moved to the Museum, December 1949. A. Radcliffe, M. Baker and Michael Maek-Gérard, The Thyssen-Bornemisza Collection of Renaissance and later sculpture with works of art in bronze, London, 1992, no. 35. pp. 212-217. J. Warren, 'The Faun who plays on the pipes': the Oxford Pan and Desiderio da Firenze, forthcoming publication. J. Pope-Hennessy, A.F. Radcliffe and T.W.I. Hodgkinson, The Frick Collection an Illustrated Catalogue, III, New York, 1970, pp. 80-87. W. Bode, The Italian Bronze Statuettes of the Renaissance, ed. and rev. by J. Draper, New York, 1980, p. 109, pl. CCXLII. This inkwell appears to be a unique cast, although it is closely related to three variant bronzes in The Frick Collection, the Schlossmuseum in Gotha, and the Thyssen-Bornemisza collection. In his catalogue entry on the latter example, Radcliffe notes that these four are, in turn, related to a larger group of satyr inkwells; the group can be categorised into three basic types (Radcliffe, loc. cit.). Although the poses, minor details and attributes change from one bronze to the next within the group, Radcliffe noted that the torso in each was so consistent as to suggest that they had all come from a single model. He concluded that '...the surfaces of the figures were modelled individually in wax over a core that was moulded in sections capable of assembly in a limited number of different ways, so allowing the poses of the arms, legs and heads to be varied' (ibid., p. 216). The models may have been used over a number of years, thereby accounting for some of the variations of quality and casting technique; certainly the present bronze is a thicker walled cast than its closest counterpart, in the Frick Collection. When Wilhelm von Bode included the Frick version (then in the collection of Pierpont Morgan) in his catalogue of Italian renaissance bronzes (loc. cit. ), he attributed it to Riccio. However, although loosely derived from Riccio's style, it is now generally accepted that these bronzes must originate from an independent workshop in the same milieu. Jeremy Warren argues persuasively (op. cit.) that the inkwells are part of a larger group which he attributes to Desiderio da Firenze (active 1532-1545), on the basis of common motifs and physiognomical types that he ultimately links to Desiderio's signed Voting Urn of 1532-33. 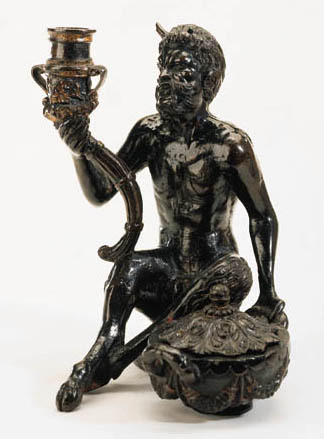 However, comparison with the satyr seated atop the incense burner of the preceding lot shows sufficient differences - not least in the facial type - to suggest that a full attribution of this inkwell to the same hand might be premature. This work is distinguished by having been a part of the Royal Saxon collection, formed to a great degree by Augustus the Strong. An ardent emulator of King Louis XIV of France, Augustus' political and artistic ambitions were equally extraordinary, and although his domestic and foreign policies were only partially realized, his achievements included the acquisition of the elective throne of Poland, as King Augustus II, and the transformation of Saxony, bringing Saxon Baroque architecture (particularly in Dresden, most importantly through the erection of the Zwinger) and the visual arts to an unprecedented peak, including the foundation of the Meissen factory. One of his most important achievements as patron was the systematic reorganisation and considerable extension of the family collections, which were also opened to the public, perhaps the first such public museum in Europe. These collections included the print rooms, the Grünes Gewölbe, the collection of antiquities, and above all the Gemäldegalerie, created in 1722 when the Stallhof, dating from the sixteenth century was converted into a gallery by Raymond Leplat. An inventory was drawn up of all the paintings in the royal palaces and 535 works were assembled to form what remains today one of the most prestigious collections of art in the world.